The southern litmus test: If you’re drooling right now, you must have spent some time in your life below the Mason-Dixon line. Chicken and waffles (yes, served together) is a southern tradition. And let me tell you, if you want to get your hands on some of the world’s best chicken and waffles, here in Atlanta is the place. 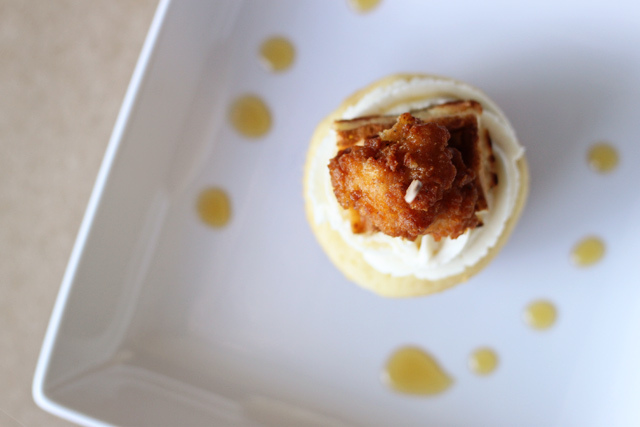 I wanted to pay an homage to this salty-meets-sweet southern dish the best way I know how—with cupcakes. So here you have it. 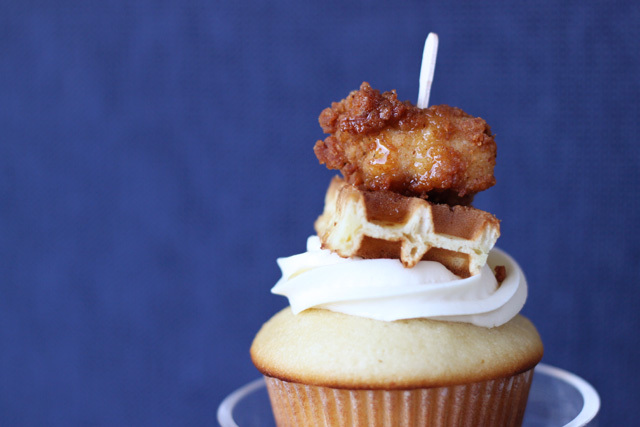 A waffle-inspired yellow buttermilk cupcake topped with maple syrup buttercream frosting and a mini helping of chicken and waffles. And just in case that whole deal doesn’t sound amazing enough, let me tell you what else is special about these guys: Each cupcake is infused with a shot of straight-up maple syrup right in the center. Why? Because I’m just like Buddy the Elf. I try to stick to the four main food groups: candy, candy canes, candy corns and syrup. 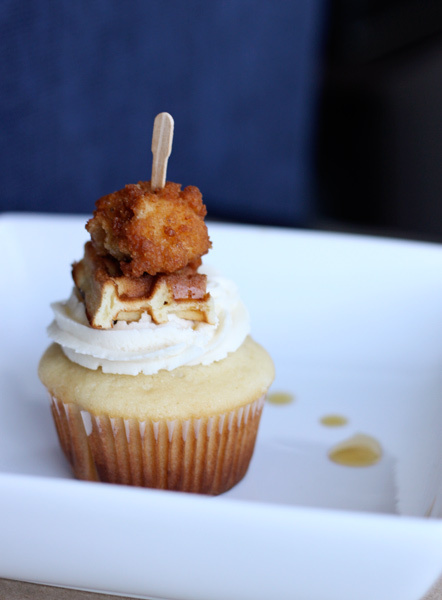 I completed my cupcakes with a little help from another Atlanta institution, Chick-fil-A. If you want to fry up your own bite-size bits of chicken for these ‘cakes, more power to you. But I know that I could never top Chick-fil-A’s nuggets. Plus they’re literally the perfect size. And if you’re wondering how you eat these, I’ll let you in on a little lesser-known culinary secret: Just bite down. Make sure you wrap your teeth around each layer from top to bottom and take a huge bite of everything at once. It’s not called chicken then waffles, it’s chicken and waffles. Preheat oven to 350°F. Line two cupcake pans with 24 cupcake liners. Sift or whisk together both flours, baking soda, baking power and salt. With an electric mixer on medium-high speed, cream together the butter and sugar until the mixture is pale and fluffy. Reduce the speed to medium and add the whole eggs one at a time, mixing well after each addition. Add the egg yolks and beat until thoroughly combined. Reduce speed to low and add the flour mixture in three parts, alternating with two additions of buttermilk. Be sure to mix well after each addition. Beat in the vanilla extract last. Pour the batter into liners, filling each cup about three-quarters of the way up. Bake for 20 minutes, or until they pass the toothpick test. Lift them out onto wire racks to cool. 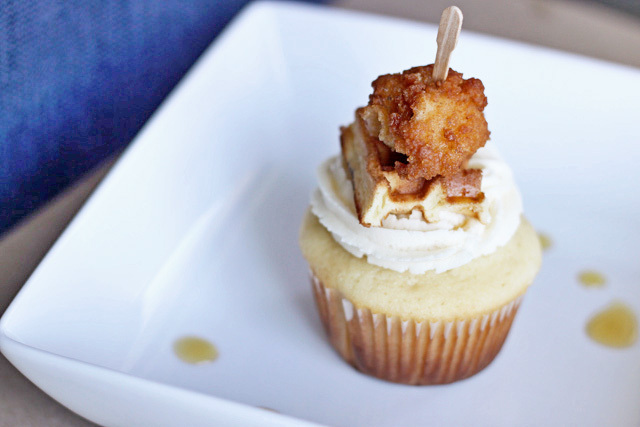 With a food injector, inject roughly one teaspoon of maple syrup into the center of each cooled cupcake. In a small bowl, beat together the butter and syrup until blended. Gradually beat in the powdered sugar until the frosting is smooth. If the frosting is too thick, add just enough maple syrup or milk to thin out the consistency. I think I love it & can’t wait to try it! My husband will die when I show him these! I’m not sure my heart can take it! Can his heart take it? LOL. So glad you like them! I just came across your blog on Cupcakes Take the Cake, and I think I’m hooked based on this recipe. This looks amazing. Aww, thanks! I think I love your blog, too (subscribing!). Thanks so, so much for coming over and commenting. You are brilliant. I would like one to try, please. 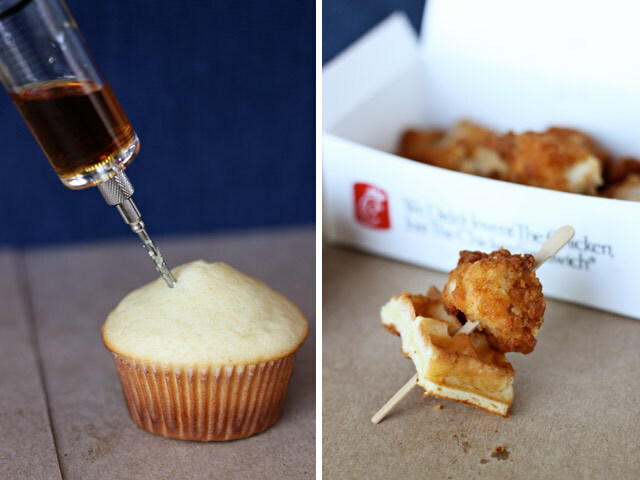 Syringe plus maple syrup… I’m in. Oh the cupcake too. I almost forgot. Ha! I’m with you–let’s just inject the stuff! Well, I’ve never been east of the Rocky Mountains, but my mouth is still watering. Nice work! I am intrigued. I was hoping for bits of the chicken nuggets inside the cupcake, too. sERIOUSLY??? The most brilliant idea ever! These look INSANE. I’m not a born-and-bred southerner, but three years was plenty of time to fall in love with chicken and waffles. I am SO trying these! This is unbelievable. Roscoe’s Chicken & Waffle is one of my favorite restaurants here in Los Angeles. I love this idea, and the portion control element is genius! OMG! Those look fantastic! I can’t wait to start adapting them to the gluten-free side of things … omnomnom! I made these last week for a football tailgate (and brought some extra to work). I actually ended up with 3 dozen cupcakes, and thank goodness I did. These were gone instantly, and I’ve already got requests for more. I used Chick-fil-A nuggets and Waffle House waffles to save some time. The buttermilk cake is a great balance to the super sweet syrup and icing. I can’t wait to make these again! I won’t eat Chik-fil-A, but I’m down for using some other kind of fried chicken! These look amazing. Come to think of it, you are right! Why would I eat Turkey on Thanksgiving when I can eat it most days of the week. This year, I am out on Thanksgiving Turkey. Instead I’ll just have a little more of etieyvhrng else. FYI…also new this year is the first annual Cold Turkey 5-K Fun Run! Looks unbelievably delicious! Can’t wait to make these this weekend.